Trying to decide what to sousvide first? I did burgers and was not too impressed. So, decided to try pork. 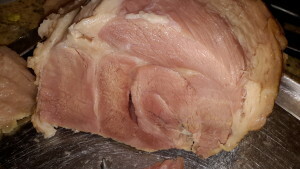 I had a piece of gammon that was purchased at half price! Always a good start and worth the risk. Place 1.7 kilo piece of gammon into an official sous vide bag and added a few whole cloves, 2 bay leaves, and about 1 1/2 cups of apple and elderflower juice that I found in my fridge that did not have much life left!! Placed the sealed bag of gammon and invented marinade into my Lakeland sousvide/slow cooking machine. After a bit of research through books and internet, I decided to set the temperature on 70 degrees C and the timer for 9 hours. Boil the above until it made a nice glaze. This dish was excellent. Going forward I would say that sousvide gammon is the only way to prepare this meat!